PAUL DERVAN: Most creative use of press advertising I've seen in a while. Most creative use of press advertising I've seen in a while. 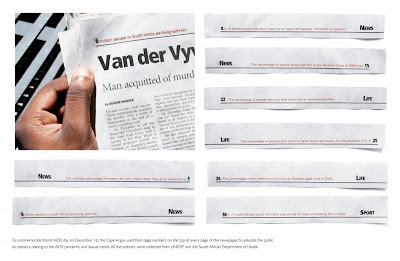 It might be a bit difficult to see here, but they've used the numbers at the top of newspaper pages to illustrate stark statistics on AIDS. So for example, on page 6, they've written "6 million people in South Africa are living with HIV". I'm sure you couldn't help but read these when flicking though the paper. Very clever. That's really smart - it reminds me of an outdoor guerilla campaign I saw in the netherlands using street signs - they overlayed similar 'homeless' stats on 'distance to' type signs. thanks for the comments lads. I'm going to ask a mate in Irish Times if this is something they can / would do.